As we’ve been reminded by the fight in Indiana, supporters of discrimination have always cloaked their views in appeals to personal liberty. “History doesn’t repeat, but sometimes it rhymes,” Mark Twain allegedly said. And there are no perfect parallels between Lester Maddox and the florists, bakers, and other small-business owners who have been invoked as a reason to protect the religious liberties of those who could legally refuse to serve gay and lesbian weddings. But amid a national debate about gay civil rights a half-century later, as we fitfully evolve toward the promise of a more perfect union, it is useful to listen for echoes of old arguments because they can clarify our current conversations. We’ve had an age-old argument in our nation between the powers of the federal government and states’ rights. It goes back to the ratification of the Constitution (ironic, because many of the states’ rights advocates since have presented themselves as the purest defenders of the Constitution) and found expression in the heated debates between John C. Calhoun and Daniel Webster, and Jefferson Davis and Abraham Lincoln, that ultimately exploded into civil war. The arguments resurfaced again in the 1960s over civil rights and desegregation. And so it goes. But the de facto defenders of slavery and segregation rarely framed their arguments as endorsements of inequality. Instead, their argument was often uplifted, framed as a defense of lofty ideals. Sometimes these were rooted in theological objections—defense of slavery and defense of segregation was at one point imbued with the hue of religious belief. But more often it was framed as a fight between individual liberty and government tyranny, with no irony intended. Maddox, if he is remembered today, is perhaps best known as a refrain in the ’70s-era satirical Randy Newman song “Rednecks,” which proclaims, “Well, he may be a fool, but he’s our fool, and if you think that you’re better than him you’re wrong.” The song goes on to jab at the hypocrisy of self-righteous Northern critics who denounce the South while ignoring the segregation that hides under their own noses in cities like New York, Chicago, and Boston. But as with all satire, the song contains a serious point that echoes on today: When conservative populism rears its head, liberals often make divisions worse by denying the respective humanity and individuality of the people with whom they disagree, compounding resentments that can turn into political backlash that endures for decades. What’s sinister is the Orwellian mislabeling of the impulses behind resistance to civil rights progress that aims to ensure equal protection as a defense of liberty. And while it’s become fashionable for conservatives to honor Martin Luther King and venerate past civil rights fights, it’s nothing more than an attempt to benefit from historical amnesia unless they are willing to apply those lessons to present-day debates. That means respecting the core conservative value of individual freedom in reality rather than just rhetoric. 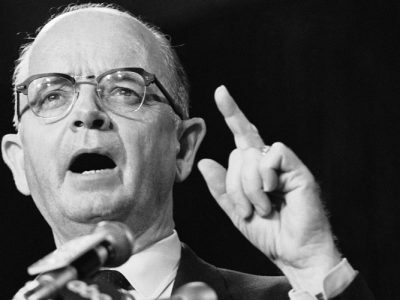 In the Ballad of Lester Maddox, the lyrics change but the melody remains the same. It echoes across the decades, age-old arguments where freedom to discriminate becomes the emotional litmus-test of liberty. Direct parallels may miss the point, but ignoring these echoes blinds us from the ability to see current events in light of history and to anticipate what arguments will look like generations from now.